Tools for protecting Intellectual Property Copyrights, trademarks, patents, trade secrets, etc. 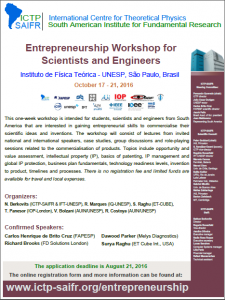 This one-week workshop is intended for students, scientists and engineers from South America that are interested in gaining entrepreneurial skills to commercialise their scientific ideas and inventions. The workshop will consist of lectures from invited national and international speakers, case studies, group discussions and role-playing sessions related to the commercialisation of products. Topics include opportunity and value assessment, intellectual property (IP), basics of patenting, IP management and global IP protection, business plan fundamentals, technology readiness levels, invention to product, timelines and processes. There is no registration fee and limited funds are available for travel and local expenses. Accommodation: Participants, whose accommodation has been provided by the institute will stay at The Universe Flat. Each participant, whose accommodation has been provided by the institute, has received the accommodation details individually by email. BOARDING PASS: All participants, whose travel has been provided or will be reimbursed by the institute, should bring the boarding pass upon registration, and collect an envelope to send the return boarding pass to the institute.